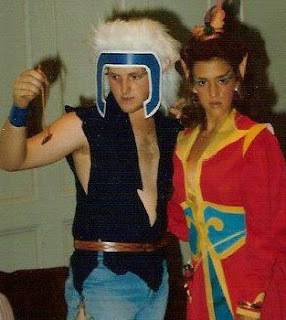 I took a lot of crap back in the day for being an Elfquest fan. And make no mistake, I was a fan. A really big fan. 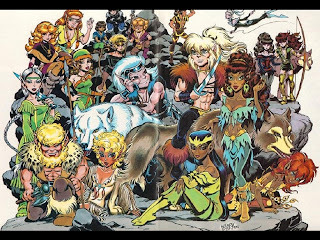 Elfquest has been easily dismissed by many comics fans (and I'm going risk sounding sexist by saying primarily male comics fans), as being too cutesy. People tended to see the art style, with the big eyes and the child-like anatomy and protagonists who smiled in wonder a lot and misunderstand what the series was about. Apparently, it appeared girly, or silly, or too pretty at a time when Miller's Daredevil and the Wolverine mini-series were starting the grim-and-gritty ball rolling. As popular as fantasy has been in fiction, as Lord of the Rings has proven, there are still a huge contingent of people who just can't take anything with elves or other fantasy creatures seriously. Weird aliens and Lovecraftian monsters, it seems, are just fine, but dragons and fairies push the bounds of acceptance. Whatever. Elfquest was so much more than what people assumed. First, a little history. 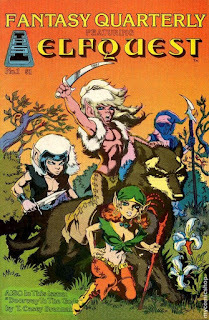 Elfquest was one of the first self-published, Direct Sales only comics in the late 1970's (along with Cerebus, The First Kingdom, and a few other contenders). Wendy and Richard Pini (WaRP Graphics, as they eventually named their company), had met through the letters page of an issue of Silver Surfer, connected through the comic convention circuit and got married. Wendy was the writer and artist and Richard the business manager, though they have always insisted that his role on the creative end of Elfquest could not be ignored. If memory serves they had approached Marvel and DC with Elfquest and were rejected as not being marketable. 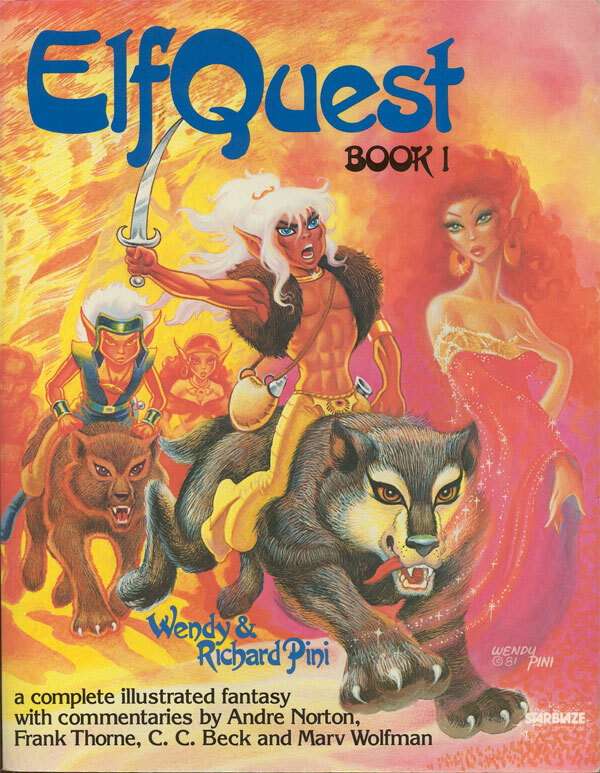 Elfquest first appeared in Fantasy Quarterly #1, published by The Independent Publishers Syndicate. When that company quickly folded they regrouped and republished the story as Elfquest #1. The original series appeared three times a year as a black and white, magazine format comic book. It ran for twenty issues, plus an issue #21 that featured background info and artwork. The second series, ElfQuest: Siege at Blue Mountain, was eight standard comic-sized issues long, with inks by Joe Staton. There was a third series called Kings of the Broken Wheel that, for me at least, brought the main story arc to something of a close. Over the years there were spin-off series by other creators and some one-shot and mini-series by Wendy. But, for the purpose of this post, I want to focus on the first series. If you have a negative reaction to fantasy and elves, you might want to stop reading now. If you're interested in seeing why this book is worth checking out, stick around. Elfquest was the story of Cutter, eleventh chief of a tribe of woodland elves struggling to survive a harsh environment and the ever-growing threat of humans encroaching on their space. These were not the willowy, high elves of Tolkien lore. The Wolfriders, as they were known, were small, fierce hunters with more in common with Native American woodlands tribes than with European High Court culture. Though long-lived they were not immortal (though we eventually discover other Elves are). They were displaced from their traditional forest home by a fire set by humans to drive them out. After surviving a journey through a desert the Wolfriders discover something they never dreamed existed: Another community of Elves. They had believed they were the last of their kind. This encounter provides the spur for the rest of the series. Cutter embarks on a quest to discover the origins of Elves and to discover if there are others out there. As usual, I don't want to dwell on details of plot. For me, while I enjoyed the story, the plot was secondary. What made Elfquest one of my all-time favorite comics were the characters, and this is why I urge everyone to get past whatever anti-elf prejudices you may have. appeared in the original. I just like this picture. Yes, Wendy's Elves had big eyes and pointed ears and unlikely hair, but they were some of the most fully realized human characters I've ever read (and I hope the comparison to humans doesn't upset Wendy or the fanbase). I was able to see myself and the people I knew reflected in the Elves. Their complexity reminded me of the real people I knew. For all the swords and magic and Trolls and other trappings of fantasy, Elfquest evinced my real life more than most stories I have read. Each character, and there were a lot of them, was deep and meaningful and real. The plot, the Quest itself, served as a framework to explore these characters and to focus on relationships and the events of life more than on any more specific fantasy trope. Through these characters we felt the joys of love and new life. We experienced the grief of lost loved ones. We felt jealousy and rage and the consequences of hatred and prejudice. We saw the effects of violence, as well as the intimacy of family and friendship. We watched as old ways of thinking, traditional values, were challenged by new, sometimes necessary views of the world and the conflict this can cause. It has been said for years that the story served, for the readers as well as the characters, as a SelfQuest. It was the depth of character and the intensity of genuine emotional content instead of mere sentiment that impressed me and made me a fan. The complexity of the characters came through their dialog, but more importantly, through Wendy's art. Over the course of the series we saw her get more refined and assured in her skills, but from the beginning the signature traits of the characters were there. Each of them had distinct features and characteristics, and Wendy was the master of conveying personality through expression and body language. In any scene, especially those with a lot of characters present, each and every one of them was recognizable. More importantly, each of them was always engaged in a character-specific activity. Expressions, stance, placement with other characters, and what they were doing always conveyed specific personality. Wendy communicated more information about her characters in subtle gestures than some artists can manage in their entire career. The Wolfrider Woodlock doesn't have a single line of dialog until issue #6, but by then we already know everything we need to know about who he is and the role he plays in the tribe, simply by his presence in the preceding five issues. Wendy was one of the first American comics artists who was significantly influenced by Manga. This is obvious now, but at a time when most of us had no access to Japanese comics it felt very fresh to eyes grown accustomed to the Marvel and DC house styles. But even then, Wendy didn't slavishly copy Manga, the way so many American and Japanese artists have done since. She filtered the influence through her own lens, combined it with other forms and created something that was uniquely her own style. Wendy and Elfquest are significant in a larger “History of Comics” way as well. Being one of the first self-published, Direct Sales only comics is only part of what WaRP accomplished. As much as readers in the early frontier days of the direct market said they were looking for an alternative, a lot of the content was still superhero based. Surprisingly, to me at least, given the overlap of Science Fiction and Fantasy readers among comics fans, there have been very few successful series that focus on those genres. So, while WaRP was successful with a small, very supportive and vocal fanbase, they still wanted to reach out to a broader market they believed existed. As a result, they made a deal with book publisher Starblaze Donning to collect the first five issues of Elfquest (now hand-colored by Wendy instead of the original black and white), in a trade paperback format and to make it available through traditional book distributors to bookstores instead of just to comic shops. This was one of the first times (maybe the first time... I need to research this), that this had happened. Today we can find pretty much any comics graphic novel or trade in bookstores but at the time it was an innovation. And, it was successful. Elfquest found a much bigger audience among SF/Fantasy fandom that led to greater sales in bookstores than through comics specific outlets. If an audience for your work doesn't exist within the traditional comics fanbase then find that audience elsewhere. This is pretty much what I recommended the major publisher do now in my post on comics companies and taking chances. This color volume was the way I first encountered Elfquest. I had read about it in some comics magazine, but had no access to comics shops when the issues were first coming out. I saw some of the actual issues at the first Comics Con I went to (PittCon '81 at Duquesne University), but didn't buy them. When I saw the TP in a Walden Books at the mall I put it on my Christmas list that year. I devoured it that Christmas Day (the internet tells me this was published in 1981). At the next PittCon I bought all of the back issues, including the first five that were in the collection, from Jack McGonigle, a long-term comics fan and retailer in the Pittsburgh area (RIP Jack). They were up to issue #12 at the time. From an ad in the back of the issues I subscribed and about a month later issue #13 arrived in the mail. Then I waited. Elfquest came out three issues a year, so it took a little over two years for me to finish the story. Patience was a required virtue for Elfquest fans back in the day. I think, for any of us who pursue the hobby of fiction, whether in books or comics or movies or TV or all of the above, every once in a while we encounter a specific character who for some reason resonates with us in very personal ways. It can be really difficult to describe exactly why that is. I think it is because, more than other characters, we are able to see a reflection of our true selves. I'm on record as saying that Hawkeye is my favorite superhero, but as much as that is true, and as much as I see aspects of myself in him, he doesn't always resonate with my true self. Part of that is because company characters are written by so many hands that there is no real consistency. Elfquest provided a character that has made the very short list of fictional personas that seem to reach into my psyche in a way that makes me see aspects of my deeper nature. 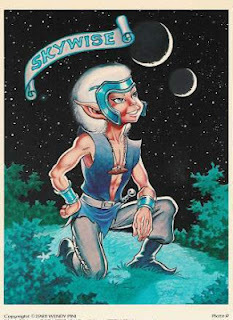 Skywise was the curious stargazer of the Wolfrider tribe. He was intelligent and curious and filled with a joy of life. Even before Cutter went on his quest, it was Skywise who was always looking to the sky and imagining that there was more to life. He was the one who wanted to fly and touch the stars. As others grew older around him Skywise eventual became the immortal, the eternal youth, the puer eternis. The love he felt for his best friend, Cutter, was one of the core values of his life. They were referred to as “Brothers in all but blood” and the constancy of that friendship through changing circumstances perfectly reflected the way I felt about my relationship with my best friend (and still does). And I'm aware of how silly some of that may sound to others and I don't really care. I'm truly sorry for those who are embarrassed by sentiment and genuine depth of feeling. To lighten things up a bit, here's a picture of my one official Cosplay at a comics con (though the term Cosplay wasn't in use then). This was at Creation Con at the Chatham Center in Pittsburgh in the summer of 1982. That's my friend Peggy as Leetah in a much better costume than I managed. So, to summarize... Elfquest Good! I get that it will not appeal to everyone, whether it's a matter of taste or elf-prejudice or whatever. It's a great example of comics art and storytelling (I can't imagine any fan of Manga not seeing some value in it. Everyone else should read it too). The series is not currently in print, though I'm sure there are countless volumes available out there for sale somewhere. The good news is that WaRP has made the entire series, everything, available to read online for free at their website. Go to Elfquest.com to learn more and read some great comics. Elfquest is copyright Wendy and Richard Pini. Thank you! I read the newest issue yesterday. I'm definitely still a fan. Thanks for this article. EQ has been a part of my life since junior high. I'm middle age now. I stuck it out with EQ too even when other readers I had introduced it to eventually moved on. It's been well worth the wait on the new stories and I'm so glad that my patience for this incredible series paid off handsomely.